The Evangelical Alliance has produced Transformed as a brief biblical and pastoral introduction to understanding transgender in a changing culture. 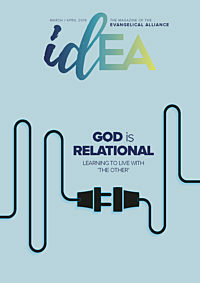 The resource follows an extended period of consultation and discussion and seeks to provide a nuanced contribution into a debate that creates challenges and opportunities churches on a personal and an ideological level. Transformed helps the church is to be a place welcome and compassion for those who are transgender and their friends and family, so we can affirm the dignity of every person and point to the radical redemption that Jesus offers all of us. It seeks to counter the cultural narrative of individualism, deconstruction and consumerism with the story of the gospel - that through Jesus we are all loved, forgiven and transformed. Peter Lynas, the director of Northern Ireland at the Evangelical Alliance, led the development of this resource, and comments on its publication: “In our current cultural conversation around trans, there is a great deal of confusion. Our members have asked for support and so we went out and listened and learnt. There is so little clarity for all concerned. The NHS has no agreed measure of success and the government has run a large consultation on the possibility of being able to self-identify in your gender of choice. Transformed is the result of the Evangelical Alliance talking to different interest groups and hearing the experiences of transgender people. As the resource notes at the start: “If you have met one transgender person, you have met one transgender person”. Throughout we have sought to bring nuance and care to this topic and suggest practical pastoral responses built on a shared biblical understanding of human identity outworked in a specific local context. The Transformed booklet is part of a range of resources being created by the Alliance which will include video interviews and a talk. “We have heard repeatedly from our members in recent years that this is an issue they require advice and support on. We do not have all the answers, but we are committed to resourcing our members and supporting them as they seek to love and serve their communities.” says Lynas.